Wednesday March 27, 2019 - Former Gem MP, Jakoyo Midiwo, is broke going by what he told a Kisumu Court on Tuesday. Last year, Midiwo who is NASA leader, Raila Odinga’s immediate cousin, was slapped with an invoice of Sh 1,716, 820 after losing the petition against his successor Elisha Odhiambo’s victory. Midiwo is paying a similar amount to IEBC and the Returning Officer for Gem Constituency after he lost the case. On Tuesday, Midiwo asked the court in Kisumu to allow him to settle a Sh 1.7 million election petition cost in Sh 50, 000 instalments. 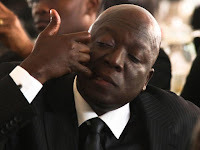 “The applicant [Midiwo] is unable to pay the taxed sum at once and yet the 30 days stay of execution is to lapse on March 13, 2019,” Midiwo states in court papers. He sought the court’s intervention to allow him to clear the debt in instalments of Sh50,000 every month until such a time that all the money is settled. He said he only receives a pension of Sh 125,000 and he is unable to settle sh 1.7 million at once. “I’m a pensioner receiving Sh 125, 000 monthly before tax and my family depends on the same pension for upkeep as it is our main source of livelihood,” Midiwo told the court in an affidavit signed by his lawyer. Midiwo first lost to Odhiambo in ODM primaries forcing him to contest for the seat as an independent candidate. He lost the seat to Odhiambo in the August 8, 2017, General Elections. He moved to court to challenge Odhiambo’s win but lost.